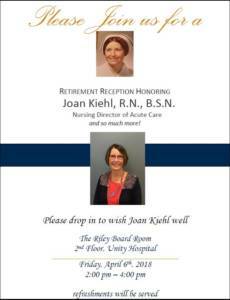 After 42 years, Joan Kiehl, RN, BSN, Director of Acute Care and so much more, is retiring from Unity Hospital, on Friday, April 6. During her 39 years with the health system, Joan has spearheaded many nursing initiatives, including Joint Commission Readiness, Unity’s Expansion and Renovation Project, as well as building key relationships with all departments. Joan has also coached and mentored numerous nurses throughout her career, leaving a lasting legacy. Her colleagues shared that Joan’s knowledge and attention to detail are inspirational! A reception will be held in her honor on Friday, April 6 at 2 pm in the Riley Board Room at Unity Hospital. Please join Rochester Regional Health in wishing Joan well on her retirement and thanking her for her extraordinary service! Posted March 29, 2018 under _Featured Stories List, Leaders / Managers, News, Nurses, Recent News, Unity Hospital, Weekly Beat.